Our veterinarians and nutritionist determined the best combination of natural preservatives, specifically mixed tocopherols and citric acid, to protect the nutrients of Lafeber's Premium Daily Diet pellets. 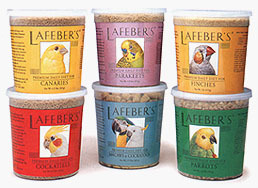 Lafeber's pellets are the only real pelleted food found in pet stores. Most of the other “pellets” are actually extruded diets. Lafeber prefers to pellet because a higher quality product is achieved. Pelleting is a gentler food process as compared to extrusion. Pellets reach a temperature of around 165 degrees when formed and are then cooled. Because extrusion generally requires 100% gelatinization of the starches (the starches melt), the food is generally heated to 250-275 degrees under high pressure 300-600 psig when formed, and then must be cooked for approximately 20 minutes. Because of the extrusion processing, extruded foods generally need to be supplemented an extra 20-30% due to a nutrient loss as compared to only a 10% loss during pelleting. Ground corn, soybean meal, wheat flour, oat groats, cane molasses, dried whole egg, canola oil, dicalcium phosphate, ground limestone, iodized salt, citric acid, dl-methionine, l-lysine, vitamin A supplement, vitamin D3 supplement, vitamin E supplement, ascorbic acid, menadione sodium bisulfite complex, niacin supplement, calcium panthothenate, riboflavin supplement, thiamine mononitrate, pyridoxine hydrochloride, vitamin B12 supplement, folic acid, copper lysine, choline chloride, zinc oxide, manganese oxide, mixed tocopherols, biotin, sodium selenite. Ground corn, soybean meal, wheat flour, oat groats, cane molasses, dried whole egg, canola oil, dicalcium phosphate, ground limestone, iodized salt, citric acid, dl-methionine, l-lysine, vitamin A supplement, vitamin D3 supplement, vitamin E supplement, ascorbic acid, menadione sodium bisulfite complex, niacin supplement, calcium panthothenate, riboflavin supplement, thiamine mononitrate, pyridoxine hydrochloride, vitamin B12 supplement, folic acid, copper lysine, choline chloride, zinc oxide, manganese oxide, mixed tocopherols, biotin, selenium.